For the 9th-century king of Picts, see Óengus II. The figure of the Old Testament King David shown killing a lion on the St Andrews Sarcophagus is thought to represent King Óengus. The figure is dressed as a Roman emperor of Late Antiquity and wears a fibula like that of the Emperor Justinian on the mosaic at San Vitale, Ravenna. Óengus son of Fergus (Pictish: *Onuist map Urguist;[lower-alpha 1] Old Irish: Óengus mac Fergusso, "Angus mac Fergus"), was king of the Picts from 732 until his death in 761. His reign can be reconstructed in some detail from a variety of sources. Óengus became the chief king in Pictland following a period of civil war in the late 720s. During his reign, the neighbouring kingdom of Dál Riata was subjugated and the kingdom of Strathclyde was attacked with less success. The most powerful ruler in Scotland for over two decades, he was involved in wars in Ireland and England. Kings from Óengus's family dominated Pictland until 839 when a disastrous defeat at the hands of Vikings began a new period of instability, which ended with the coming to power of Cináed mac Ailpín. Selected political groups in Northern Britain around 740 AD. Four battles large enough to be recorded in Ireland were fought in 728 and 729. Alpín was defeated twice by Óengus, after which Nechtan was restored to power. In 729 a battle between supporters of Óengus and Nechtan's enemies was fought at Monith Carno (traditionally Cairn o' Mount, near Fettercairn) where the supporters of Óengus were victorious. Nechtan was restored to the kingship, probably until his death in 732. On 12 August 729 Óengus defeated and killed Drest in battle at Druimm Derg Blathuug, a place which has not been identified. 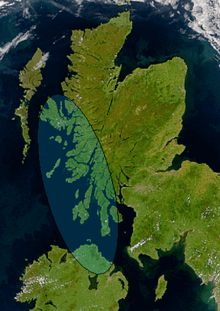 Satellite image of northern Britain and Ireland showing the approximate area of Dál Riata (shaded). In the 730s, Óengus fought against Dál Riata whose traditional overlords and protectors in Ireland, the Cenél Conaill, were much weakened at this time. A fleet from Dál Riata fought for Flaithbertach mac Loingsig, chief of the Cenél Conaill, in his war with Áed Allán of the Cenél nEógan, and suffered heavy losses in 733. Dál Riata was ruled by Eochaid mac Echdach of the Cenél nGabráin who died in 733, and the king lists are unclear as to who, if anyone, succeeded him as overking. The Cenél Loairn of north Argyll were ruled by Dúngal mac Selbaig whom Eochaid had deposed as overking of Dál Riata in the 720s. Fighting between the Picts, led by Óengus's son Bridei, and the Dál Riata, led by Talorgan mac Congussa, is recorded in 731. In 733, Dúngal mac Selbaig "profaned [the sanctuary] of Tory Island when he dragged Bridei out of it." Dúngal, previously deposed as overking of Dál Riata, was overthrown as king of the Cenél Loairn and replaced by his first cousin Muiredach mac Ainbcellaig. In 734 Talorgan mac Congussa was handed over to the Picts by his brother and drowned by them. Talorgan son of Drostan was captured near Dún Ollaigh. He appears to have been the King of Atholl, and was drowned on Óengus's order in 739. [lower-alpha 11] Dúngal too was a target in this year. He was wounded, the unidentified fortress of Dún Leithfinn was destroyed, and he "fled into Ireland, to be out of the power of Óengus." In 740, a war between the Picts and the Northumbrians is reported, during which Æthelbald, King of Mercia, took advantage of the absence of Eadberht of Northumbria to ravage his lands, and perhaps burn York. The reason for the war is unclear, but it has been suggested that it was related to the killing of Earnwine son of Eadwulf on Eadberht's orders. Earnwine's father had been an exile in the north after his defeat in the civil war of 705–706, and it may be that Óengus, or Æthelbald, or both, had tried to place him on the Northumbrian throne. 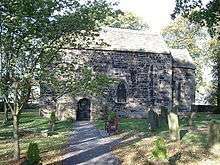 Escomb Church, County Durham. The stone churches built for Nechtan, and perhaps Óengus's church at St Andrews, are presumed to have been similar. 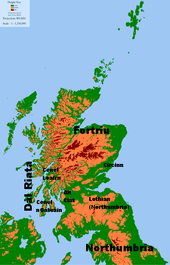 Unlike the straightforward narrative of the attacks on Dál Riata, a number of interpretations have been offered of the relations between Óengus, Eadberht and Æthelbald in the period from 740 to 750. One suggestion is that Óengus and Æthelbald were allied against Eadberht, or even that they exercised a joint rulership of Britain, or bretwaldaship, Óengus collecting tribute north of the River Humber and Æthelbald south of the Humber. This rests largely on a confused passage in Symeon of Durham's Historia Regum Anglorum, and it has more recently been suggested that the interpretation offered by Frank Stenton—that it is based on a textual error and that Óengus and Æthelbald were not associated in any sort of joint overlordship—is the correct one. In the year of the Lord's incarnation 756, king Eadberht in the eighteenth year of his reign, and Unust, king of Picts led armies to the town of Dumbarton. And hence the Britons accepted terms there, on the first day of the month of August. But on the tenth day of the same month perished almost the whole army which he led from Ouania to Niwanbirig. The story of the foundation of St Andrews, originally Cennrígmonaid, is not contemporary and may contain many inventions. The Irish annals report the death of "Tuathalán, abbot of Cinrigh Móna", in 747, making it certain that St Andrews had been founded before that date, probably by Óengus or by Nechtan son of Der-Ilei. [lower-alpha 16] It is generally presumed that the St Andrews Sarcophagus was executed at the command of Óengus. [lower-alpha 17] Later generations may have conflated this king Óengus with the 9th century king of the same name. The choice of David as a model is, as Alex Woolf notes, an appropriate one: David too was an usurper. Óengus, king of the Picts, died. From the beginning of his reign right to the end he perpetrated bloody crimes, like a tyrannical slaughterer. with feet, with hands, with broad shields. ↑ Forsyth (2000) discusses the various forms of Óengus's name, also providing Ungus(t) as an alternative Pictish form. ↑ Most sources are collected in Early Sources of Scottish History (ESSH) and Scottish Annals from English Chroniclers (SAEC), edited by Alan Orr Anderson. ↑ Early 8th-century bishops include Curetán, Fergus and Brecc. Surveys of North Britain can be found in D. W. Harding, The Iron Age in Northern Britain: Celts and Romans, Natives and Invaders (2004), and Leslie Alcock, Kings & Warriors, Craftsmen & Priests in Northern Britain AD 550–850 (2003). Foster (2004) excludes southern Scotland and northern England. ↑ Surveys of Northumbria include David Rollason's Northumbria, 500–1100: Creation and Destruction of a Kingdom (2003), and Nick Higham's The Kingdom of Northumbria AD 350–1100 (1993). ↑ John Bannerman, Studies in the History of Dalriada (1974), remains the standard work on Dál Riata. ↑ "Rotri, king of the Britons", whose death is recorded in the Annales Cambriae s.a. 754, has sometimes been identified as a king of Alt Clut, but this notice refers to Rhodri Molwynog ap Idwal, King of Gwynedd. ↑ An early cycle of tales have Conall Corc traveling to Pictland, and there taking the daughter of the Pictish king as his first wife, hence Coirpre's epithet. In any case, contacts between Scotland and distant Munster are known from the earliest times. The early Dál Riata were said to have lived in West Munster (Iarmuman) before migrating to Ulster and western Scotland. ↑ The genealogy appears in the Rawlinson B 502 manuscript, ¶1083. ↑ Yorke (2006), pp. 49–50, 54 & 288–289 discusses the reconstructed relationship between late Pictish kings. Talorgan is a hypocoristic form of Talorg. ↑ For reports of events from 724 to 729, see Anderson (1990), pp. 221–227. For Óengus as Nechtan's supporter, Henderson (1998), pp. 155–156 and Woolf (2005), p. 36. ↑ Talorgan was related to Nechtan, and is called his brother in 713, which may mean half-brother, foster-brother, or brother-in-law. ↑ Who led the Dál Riata in 741 is unclear: the sons of Fiannamail ua Dúnchado named by the Annals of Ulster may be unconnected, and the mention of Alpín son of Crup, sometimes taken to be the same person as the Alpín overthrown in 729, may be misplaced. ↑ As already noted, most Irish annals say that Flaithbertach was supported by a fleet from Dál Riata. ↑ The entry for 752 in the Annals of Tigernach, recording "the battle of Asreth in Circinn", is thought to be misplaced. ↑ This version of the St Andrews foundation legend is given in Anderson (1980), pp. 258–260. ↑ The most recent study, Yorke (2006), favours "Óengus". ↑ It is less certain whose remains the sarcophagus contained. Woolf and MacLean (2000) argue for Óengus while Henderson favours Nechtan mac Der Ilei. Clancy, "Caustantín", favours a 9th-century date. ↑ Óengus is listed 43rd, Caustantín 80th and Eógan 100th. ↑ Sons of kings became kings more frequently in the 9th century, but it was not until the 11th century that kings were succeeded by their descendants rather than their brothers or cousins. ↑ Nechtan son of Der-Ilei and his brother Bridei are thought to have had a Gaelic father, Dargart mac Finguine of the Cenél Comgaill. ↑ Arguing otherwise, see Bannerman (1999), passim. The arguments are compared in Yorke (2006), pp. 49–50, 54 & 288–289. ↑ The strongest claims are made in those accounts which take Óengus to have been joint Bretwalda with Æthelbald, such as Charles-Edwards, Forsyth and Yorke. Other, such as Broun and Woolf, make less sweeping claims, but make Óengus among the most powerful Pictish kings and the dominant force in northern Britain. For Óengus's significance on a cultural and artistic level see Henderson & Henderson (2004), p. 12 and MacLean (2000), pp. 200–201. ↑ See Charles-Edwards (2000), Yorke (2006), pp. 236–237 and Henderson (1998), pp. 105ff. For similar images, see Henderson & Henderson (2004), pp. 130–132. ↑ After Forsyth (2000), p. 29; see also Anderson (1908), p. 57. ↑ Woolf (2005), pp. 39–40. ↑ See Clancy (2002b) and Yorke (2006), pp. 54–55. See also External links below for online editions. Anderson, Alan Orr (1908). Scottish Annals from English Chroniclers A.D. 500–1286. London: D. Nutt. Bede (1990). D. H. Farmer, ed. Ecclesiastical History of the English People. Translated by Leo Sherley-Price. Revised by R. E. Latham. London: Penguin. ISBN 0-14-044565-X. Anderson, Marjorie Ogilvie (1980). Kings and Kingship in Early Scotland. Edinburgh: Scottish Academic Press. ISBN 0-7011-1604-8. Aitchison, Nick (2006). Forteviot: a Pictish and Scottish royal centre. Bannerman, John (1999). "The Scottish takeover of Pictland and the relics of Columba". In Dauvit Broun; Thomas Owen Clancy. Spes Scotorum: Saint Columba, Iona and Scotland. Edinburgh: T. & T. Clark. ISBN 0-567-08682-8. Broun, Dauvit (1998). "Pictish kings 761–839: integration with Dál Riata or separate development". In Sally Foster. 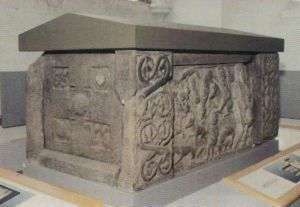 The St Andrews Sarcophagus: a Pictish Masterpiece and its International Connections. Dublin: Four Courts Press. pp. 71–83. ISBN 978-1-85182-414-4. Byrne, Francis John (2001). Irish Kings and High-Kings (2nd revised ed.). Dublin: Four Courts Press. ISBN 1-85182-196-1. Charles-Edwards, T. M. (2000). "'The Continuation of Bede', s.a. 750: High-Kings of Tara and 'Bretwaldas'". In Alfred P. Smyth. Seanchas: Studies in Early Medieval Irish Archaeology, History and Literature in Honour of Francis J. Byrne. Dublin: Four Courts Press. ISBN 1-85182-489-8. Clancy, Thomas Owen (2002a). "Caustantín son of Fergus (Uurgust)". In M. Lynch. The Oxford Companion to Scottish History. Oxford, UK: Oxford University Press. ISBN 0-19-211696-7. Clancy, Thomas Owen (2002b). "Nechtan son of Derile". In M. Lynch. The Oxford Companion to Scottish History. Oxford, UK: Oxford University Press. ISBN 0-19-211696-7. Foster, Sally (1998). "Discovery, recovery, context and display". In Sally Foster. The St Andrews Sarcophagus: a Pictish Masterpiece and its International Connections. Dublin: Four Courts Press. pp. 36–62. ISBN 978-1-85182-414-4. Foster, Sally (2004). Picts, Gaels, and Scots: Early Historic Scotland (2nd ed.). London: Batsford. ISBN 0-7134-8874-3. Forsyth, Katherine (2000). "Evidence of a lost Pictish source in the Historia Regum Anglorum of Symeon of Durham". In Simon Taylor. Kings, Clerics and Chronicles in Scotland, 500–1297: Essays in Honour of Marjorie Ogilvie Anderson on the Occasion of her Ninetieth Birthday. Dublin: Four Courts Press. pp. 19–32. ISBN 1-85182-516-9. Henderson, Isabel (1998). "Primus inter Pares: the St Andrews Sarcophagus and Pictish sculpture". In Sally Foster. The St Andrews Sarcophagus: a Pictish Masterpiece and its International Connections. Dublin: Four Courts Press. pp. 97–167. ISBN 978-1-85182-414-4. Henderson, George; Henderson, Isabel (2004). The Art of the Picts. London: Thames and Hudson. ISBN 0-500-23807-3. Kirby, D. P. (1991). The Earliest English Kings. London: Unwin Hyman. ISBN 0-04-445692-1. MacLean, Douglas (2000). "The Northumbrian perspective". In Simon Taylor. Kings, Clerics and Chronicles in Scotland, 500–1297: Essays in Honour of Marjorie Ogilvie Anderson on the Occasion of her Ninetieth Birthday. Dublin: Four Courts Press. ISBN 978-1-85182-516-5. Woolf, Alex (2002). "Ungus (Onuist), son of Uurgust". In M. Lynch. The Oxford Companion to Scottish History. Oxford, UK: Oxford University Press. ISBN 0-19-211696-7. Woolf, Alex (2006a). "AU 729.2 and the last years of Nechtan mac Der-Ilei" (PDF). The Scottish Historical Review. 85 (1): 131–137. doi:10.1353/shr.2006.0030. Woolf, Alex (2006b). "Dún Nechtain, Fortriu and the geography of the Picts". The Scottish Historical Review. 85 (2): 182–201. doi:10.1353/shr.2007.0029. Yorke, Barbara (1990). Kings and Kingdoms of Early Anglo-Saxon England. London: Routledge. ISBN 978-1-134-70724-9. Yorke, Barbara (2006). The Conversion of Britain: Religion, Politics and Society in Britain c. 600–800. London: Longman. ISBN 0-582-77292-3. Annals of Clonmacnoise at Cornell University, see p. 113ff.